The TiLite 2GX foldable wheelchair can generally be categorized as an ultra-light wheelchair due to its exceptionally light weight (<20 pounds depending upon configuration). TiLite—the manufacturer of this product—specifies this wheelchair as follows. The 2GX foldable chair can; at your option, be obtained with either a fixed or swing-away front frame structure. The frame and other chair features can be custom-manufactured in a variety of ways as indicated on the order form. 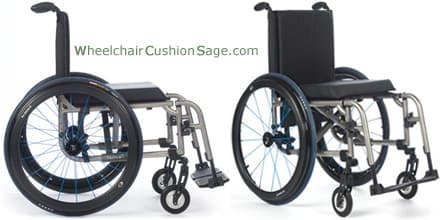 To order this wheelchair, carefully review the factory order form (linked in red above) and then contact Wheelchair Cushion Sage with your desired specifications.